Politics month is a perfect time to learn about small-multiple charts. They are a great way to compare various indicators without saturating a visualization or having one element taking precedence over the rest. Mike Cisneros already wrote a brilliant blog post on the value of turning a line chart into a small-multiple chart. I'll show you how to create a small-multiple maps, building up on a blog post by Chris DeMartini that Yvan Fornes brought to my attention. If you're new to Tableau Public, don't run away! Small-multiple maps might sound difficult, but they are actually really easy. And I'm going to explain the whole logic behind them, so read along! At the end of your read, you'll be able to recreate this viz on out-of-wedlock births in France with the data I've made available here. Import your data set, and make sure a geographic role has been assigned to your geographic data. Then start creating your generic visualization. Here, we want a filled map that shows the percentage of out-of-wedlock births per county. A double-click on the "County" dimension will create the map, and a right-click drag-and-drop of the "Proportion of births out-of-wedlock" measure onto Color will let you choose whether you want the percentage to be a sum, an average, or other aggregates. Here, an average would be the most relevant. With this, you're only two steps away from your small-multiple maps! In this second step, we will calculate how many columns and rows we need as the structure for our small-multiple maps. There is a map for every year for years ranging from 1990 to 2013, which means: (2013-1990) + 1 = 24. To have all 24 maps displayed in our visualization, we must have: number of columns x number of rows = 24. Note that this 24 is a nice number as it allows several combinations (8 x 3, 6 x 4, 12 x 2 etc). Let's choose to have six columns and four rows, in which we will fit our 24 years. The table below will help you visualize the structure (with 1990 = year 1, 2013 = year 24). Here is what our structure looks like. The logic behind the "ranking years" calculated field. The logic behind "structure columns." That's not so easy, but hope you've got the logic! Drag and drop the three calculated fields you've just built from measures to dimensions. We want to avoid Tableau Public trying to sum or average those precious calculated fields. Make sure your structure works. Open a new worksheet. 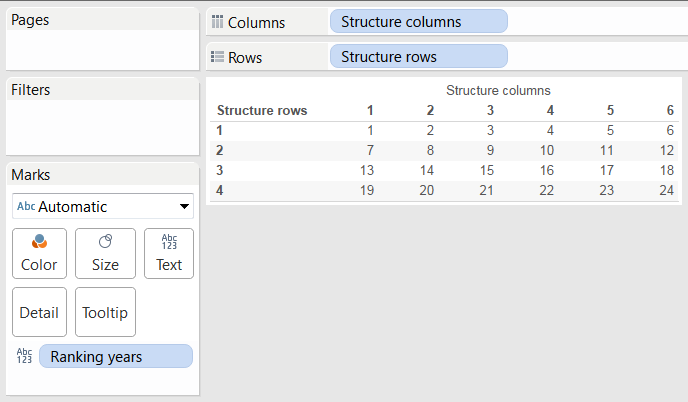 Drag and drop "structure columns" on Columns, "structure rows" on Rows, and "ranking years" on Text. If you get a table similar to the orange one above, you're only 30 seconds away from victory. Now comes the moment of truth! Go back to the map built in the first step. Drag and drop "structure columns" on Columns (before Longitude (generated)), and "structure rows" on Rows (before Latitude (generated)). Answer: These wonderful small-multiple maps! Small-multiple maps can be useful to show the evolution of votes in a given country. As a matter of fact, I wrote this tutorial with this small-multiple visualization by the New York Times in mind. I was thinking how interesting it would be to visualize French votes for right-wing parties over time and space. Hope this gives you some inspiration for the ongoing second Iron Viz feeder contest using politics data! Got a viz or a tip you'd like to share? Share them in the comments below or tweet them to us @tableaupublic using the hashtag #PoliticsDataMonth. In your example, you show "1990" and "2013". How was that done, and is there a way to add the year to each mini-chart automatically? Basically, if the value is multiple of 6, the division of it by 6 is the row number, otherwise add 1 to the floored division. I love this mapping. Is there a mechanism to import shape files directly from ArcGIS? ?